Thus would an apt summative headline on the most recent study of the Pew Internet & American Life Project on the possible future of gamification read, which was released on May 18, 2012. But that would also be a non-story, of course. The report is a breakout from the 2012 edition of the bi-annual “Imagining the Internet” survey conducted by Pew Internet and Elon University. The survey invited roughly a thousand hand-selected and self-recruited Internet experts to assess eight “tension pairs” – two diverging scenarios on the state of the Internet in 2020 with regard to one topic –, select the one they more agreed with, and explain their choices in writing. 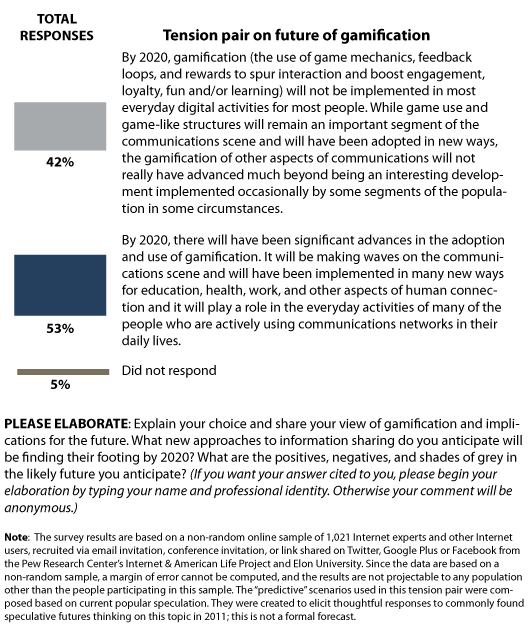 The result of the “gamification” tension pair: 42% chose “By 2020, gamification … will not be implemented in most everyday digital activities for most people”, 53% chose “there will have been significant advances in the adoption and use of gamification”, and 5% did not responded. The rest of the report highlights excerpts from the written responses, covering various topics and positions. The full tension pair and instructions for respondents to the survey. I was playing in my head how pundits and press might spin this non-story into a story (“Majority of experts agree on bright future for gamification, new study finds”), but my trusty google alert showed me that the media were already quicker: “Gamification taking over our lives, study finds”, “According to a new study, gaming is going to be creeping into our lives in a big way in the years to come,” etc. Sigh. As an artifact of the study design, which attempts to cover broad general Internet trends, the collected expert voices come by-and-large from Internet theory, sociology, and anthropology – danah boyd, Clay Shirky, Amber Case, Paul Jones, Jeff Jarvis, David Weinberger, Stowe Boyd, Steve Jones, to name but a few. All names beyond reproach, for sure, but also all people with little explicit expertise in game studies, game design, or the gaming industry. This is not a bad thing per se – it’s a refreshing outside view –, but it should be kept in mind when reading the statements. This is crucial to frame the survey result: When people were speaking for or against a presumed future pervasiveness of gamification, they were more often than not actually thinking of (serious) gaming in general. It is also misfortunate in that it implicitly supports the efforts of some gamification pundits to establish the term “gamification” as a catch-all for anything remotely game-related. Demographics aside – according to the most recent figures of the Entertainment Software Association, the average age of the US gaming population is 37 years –, this reiterates the problematic “Generation G” or “gamer generation” trope. The idea is that growing up with video games was a formative experience for a whole generation of people that powerfully shapes their preferences and expectations towards workplaces and life in general. To my knowledge, this trope was given birth to by authors John C. Beck and Mitchell Wade in their 2004 Harvard Business Press book Got Game: How the Gamer Generation is Changing the Workplace. They drew their conclusions from one survey among US business professionals with often poorly constructed, leading questions, do not report on the statistical (un)significance of their results, consistently jump from correlation to causation, and consistently over-interpret results. There is no doubt that playing video games has been and continues to be a crucial part of the life experience of millions of people across the globe. It is very likely that this will have some effect on them individually as well as culture as a whole. But to the best of my knowledge, nobody has yet conducted a solid empirical study to explore what these effects might be. So to me, the “gamer generation” sits right next to “digital natives” in a spectrum between unexplored myth and gross overgeneralization. Furthermore, the notion that “because young people like games, they will like and demand XYZ to be gamified” showcases what I like to call the “Grandma loves romance novels” fallacy – a fallacy that also appears from time to time in the discourse on serious games: “Kids like games but don’t like school books. So let’s replace math books with maths games, and kids will love maths.” The silliness of this non-sequitur becomes fully apparent when we replace kids and games with grandmothers and romance novels: “Grandmothers love romance novels but don’t like school books. So let’s replace maths books with romance novels involving maths, and grandmothers with love maths.” The medium in and of itself does not mean that whatever is conveyed in that medium automagically gains relevance, meaning, and value to a person preferring that medium. This silliness is even more pronounced when we move from “games” to “gamification”: “Grandmothers will like and demand romantic novelization. Soon, no grandmother is going to visit a dentist who doesn’t dress up like Mr Fitzwilliam Darcy and deliver his diagnosis in florid Jane Austen-style.” Just because you enjoy one thing in one context doesn’t mean you would want superficial properties of that thing indiscriminately slathered onto every other part of your existence. Several quotes seem to indicate that games (and/or gamification) are always competitive: “The word ‘gamification’ has emerged in recent years as a way to describe interactive online design that plays on people’s competitive instincts”, “It is not wise to make everything into a competition”, “Gamification has little use in cooperation”, etc. But both in Salen’s and Zimmermann’s “artifical conflict” and Juul’s “effort,” nothing demands that they derive form the competing force of another player. The wealth of single player games and cooperative games (from Pandemic to FarmVille) betrays the assumption that games are always necessarily competitive. This is not to deny that direct or indirect competition or comparison fuel a large chunk of gameplay. I only wish to emphasize, counter to the assertion made by Stowe Boyd in the report, that there is a big role for game design to facilitate collaborative and cooperative processes. While it is to be forgiven that an online survey response doesn’t reference sources, I find it problematic that the authors of the report themselves allude to “neuroscientists” without providing sources to back up their portrait. It is problematic because they are implicitly reinforcing a rhetorical maneuver made not only by certain gamification pundits: appealing to neuroscientific studies as a presumed new highest authority when it comes to ‘the truth’ regarding the human condition. Beyond that, to my knowledge – and please, dear reader, correct me in the comments if I’m wrong –, there have been no neuroscientific studies conducted yet on the effectiveness of gamified applications. The relation of play and work is a big issue that continues to befuddle the academic study of play and games, because it connects directly to an even more fundamental question, namely, in what way games and play are “separate” from the rest of everyday life. (Some of the best recent analysis on this I found in Bonnie Nardi’s excellent anthropology of World of Warcraft.) Terms like “playbour” and “weisure” quoted above already indicate how in society at large and digital (game) culture in specific, the presumed boundary/opposition of play and leisure on the one hand and work on the other have become more and more blurred. Modding, e-sports, or goldfarming are further cases in point for play activities that have become professionalized, instrumental, even waged activity. I think we are still at the very beginning of understanding the fundamental role of play (as a mode of experience and conduct) in contrast to games (as designed artifacts) in supporting the emotional, motivational, and social affordances of gameplay. And I am actually confident that studying “gamification” will help to surface and contour its contribution. So I would just want make two short remarks on what I find missing in this folk theoretical play/work opposition: First, as Csikszentmihalyi already documented in his study of flow-inducing activities in the 1970s onwards, people regularly find the most flow, meaning, fun etc. in their work already. Second, to the extent that gameplay and work are different, “game elements” and “feedback loops” are the least important bit of that difference. As I find time and time again in the interviews I’m currently conducting for my PhD, it is autonomy, voluntariness (or the lack thereof) that makes or breaks the playfulness of a situation. Overall, the Pew report offers a rich variety of often contradicting voices raising a large number of issues, resulting in a multitude that is hard to reduce to one overarching “sentiment.” That alone makes it a welcome counterpart to the confident and unilaterally optimistic predictions of technology consultancies like Gartner or Deloitte also quoted in the report. The only thing I really missed was some critical reflection on the part of the authors about the discursive effects of the report itself. When an esteemed scientific body like the Pew Research Center puts out a report on “gamification,” and a report titled “Gamification: Experts expect ‘game layers’ to expand in the future, with positive and negative results”, that already legitimizes the topic in a major way. But that is indeed a minor quibble.